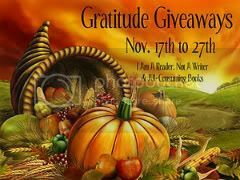 The Gratitude Giveaway Hop starts today!! So Get Hopping and *Fingers Crossed* yous win some awesome stuff! And GFC follower, of course ;-) ! Count me in, kittycrochettwo at msn dot com. I follow your blog as WV Stitcher. A great giveaway. Count me in. Hey! Good price that, eight quid! :D Makes it all much more interesting than a rounded number, hehe. Thanks for the giveaway!! Enjoying the hop , thanks for the giveaway. Wow! Awesome giveaway! =D Thanks so much! GFC follower - Saki (or it might be Saki Mai, can't quite remember ^.^). Thank you for the great giveaway and for taking part in the hop!! Thanks for the giveaway! I am a GFC follower. Thanks for the great giveaway and for making it international. Have a happy and safe holiday season and thank you for the excellent giveaway. Random prices are more fun!! I'm following via GFC as Jasmine1485 :) Thanks for a lovely giveaway! thanks for a great book giveaway. I'm a follower - Aik. I follow by google Marjorie/cenya2. Thanks for a great giveaway. Count me in. Thanks so much for the giveaway! My GFC name is LitzaLou & so is my gmail (litzalouATgmailDOTcom)! Thanks so much for the giveaway! I'm a new GFC follower under the name Ashley. Thank you for this awesome giveaway and for giving a chance for international followers to enter and win. It is deeply appreciated. God bless and more power to you! Thanks for the giveaway! GFC follower as Louisa, and lpcoolgirl@gmail.com and thanks for the giveaway! I am a GFC follower -thanks for the giveaway.